Shire Sharing provides Thanksgiving meals and warm coats to households all over the Granite State. We are a nonprofit comprised of volunteers only, run democratically by an unpaid Board of Directors. This means that 100% of your donations go directly to helping families in need — no costly overhead or paychecks. Donate today to help a neighbor! Both monetary and non-monetary donations (such as physical goods or helpful services) are happily accepted. If you have questions about how to donate, contact us. Share our cause with your coworkers, friends, family, social media network, etc. Link to this page! Each bag is customized for the household it will reach, depending on family size, dietary issues, and other needs. Visit this event on Facebook if you'd like to help stuff bags. This isn't a handout — it's a gift from friends. That's why this effort needs a special touch. Sign up here to make deliveries in your own car (bring a loved one to share the experience with). Shire Sharing is a nonprofit comprised of volunteers only; this means that all of your donations go directly to helping families in need. What makes us stand apart: We deliver meals directly to the doors of Granite Staters who need a little help. This is convenient for people with transportation or mobility issues — but it’s also personal and meaningful. In 2018, we delivered meals to almost 2,000 people in New Hampshire — and over the years we’ve delivered meals to more than 12,000 people across our state. When we started this project in 2011, we delivered to less than 200 people. Shire Sharing grows every year, achieving more and more without having to hire staff. Every penny goes to the cause! Shire Sharing began in 2011 after founder Amanda Bouldin's father, Kent Bouldin, passed away due to leukemia. During his life in Dallas, Texas, Kent ran his own "Basket Brigade" every year, handing out Thanksgiving meals to families in need. He started with just one household and eventually built his project up so that it was feeding hundreds of households per year. After his passing, it was clear that no one else would be taking over his project, and it would have died with him — but it lives on here in the Granite State thanks only to donors and volunteers like you. Although not a single one of Shire Sharing's volunteers have ever met Kent, hundreds of New Hampshire residents have gathered every year to feed thousands of their neighbors. Read more about Shire Sharing's history here. 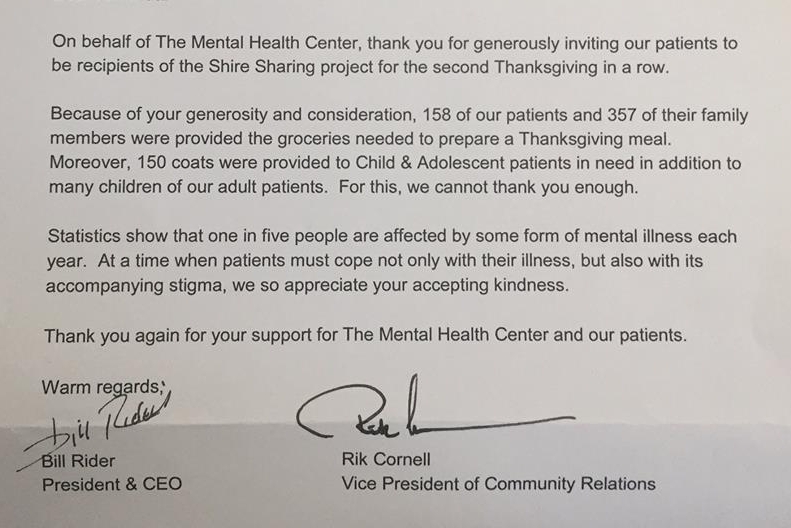 Thank you for contacting us at Shire Sharing. We will reply to your email as soon as possible. Have a good day! Shire Sharing is a 501(c) (3) nonprofit corporation. Gifts to Shire Sharing are fully tax-deductible to the donor. The board of Shire Sharing reserves the right to appropriate donations as we see fit. Donations over and above what is needed for a specified goal may be diverted to the general fund. Examples of uses of the general fund could include other food bank activities, donating to another charitable cause, providing winter coats, etc. To inquire, use our contact form.